A Hand held hedge trimmer is an effective mobile hand-held piece of equipment. Due to the mobility of the hedge trimmer it is important that it is used correctly and that adequate training has taken place to ensure accidents do not happen. This Hand Held Hedge Trimmer integrated training and assessment course is taught by an experienced instructor who will make sure that you use the trimmer safely and with confidence and that you understand the relevant regulations and safety requirements. This one-day training course in Hand Held Hedge Trimmers is available to you if you wish to update your skills and/or would like to satisfy the health and safety regulation in relation to the safe use of hand held hedge trimmers at work. 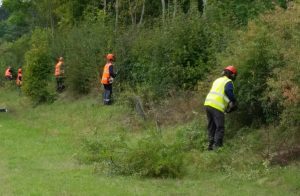 The course will also suit you if you currently use or are going to be using a hand held hedge trimmer as part of you work. Learners will receive a Lantra Awards Certificate of Competence for Hand Held Hedge Trimmers.